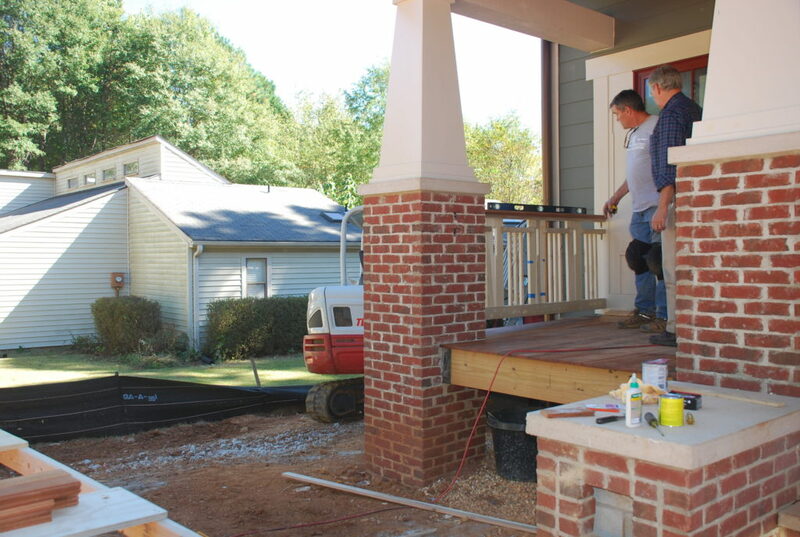 As predicted, most of progress this week was made on the outside – starting with the front porch rails. After carefully measuring and remeasuring, Clint trimmed the rest of the four handrail sections to fit in their assigned places. Once they were trimmed to size, it was time to test fit them all using metal angle brackets to hold them in place. Seems simple enough, but it was a challenge with the brackets having to mount to different materials – wood trim, brick, or a mortar joint. Here’s the second one in place on the left side of the porch. See if you can find the cattail motif that Lauren cleverly designed into the baluster pattern. When we were sure everything lined up just right, they all came down again and were taken to the basement for painting. 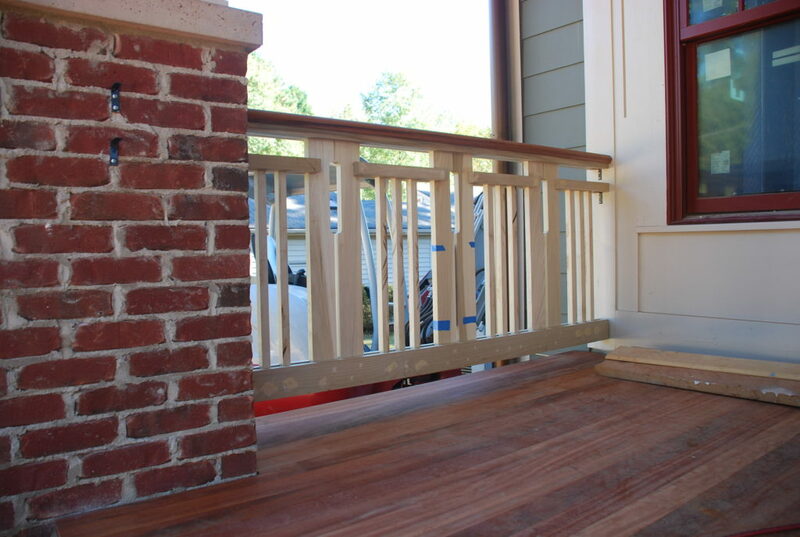 The handrail is made of the same tigerwood that we used on the front porch floor deck and will be left natural, but the rest is all poplar, which is great for painting. 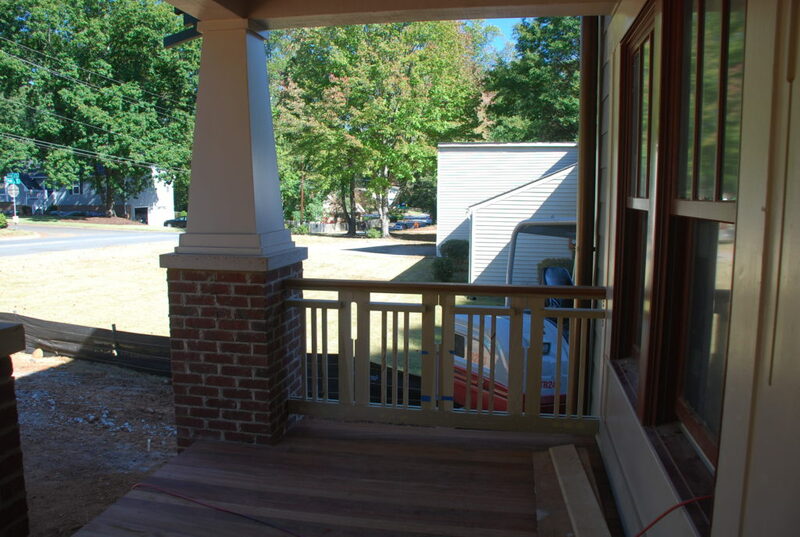 Speaking of painting – our painter was working around back to get some color on the back porch railings. 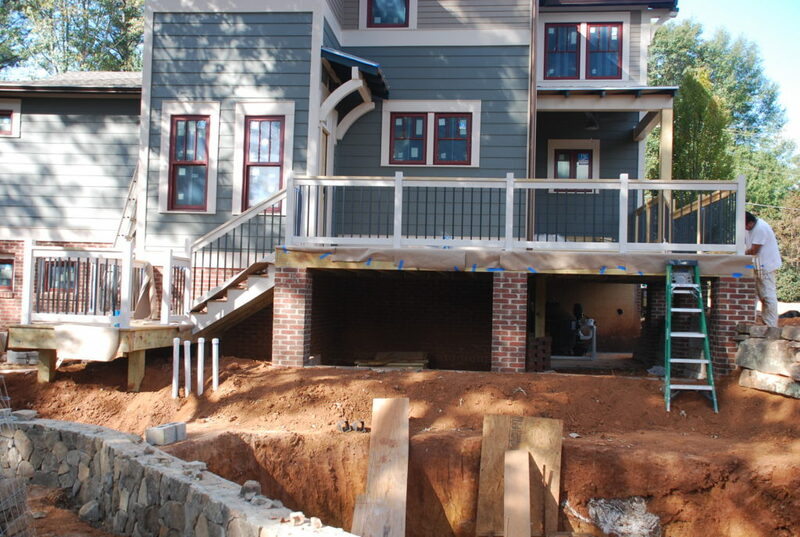 The balusters are prefinished black metal square tubes but posts and main rails are being painted using the trim color. 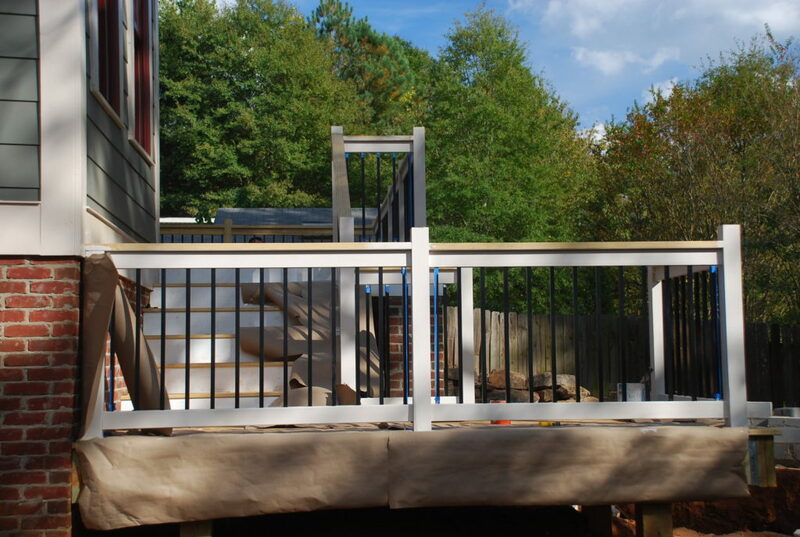 Here is a view of the whole deck with the railings being prepped and painted. 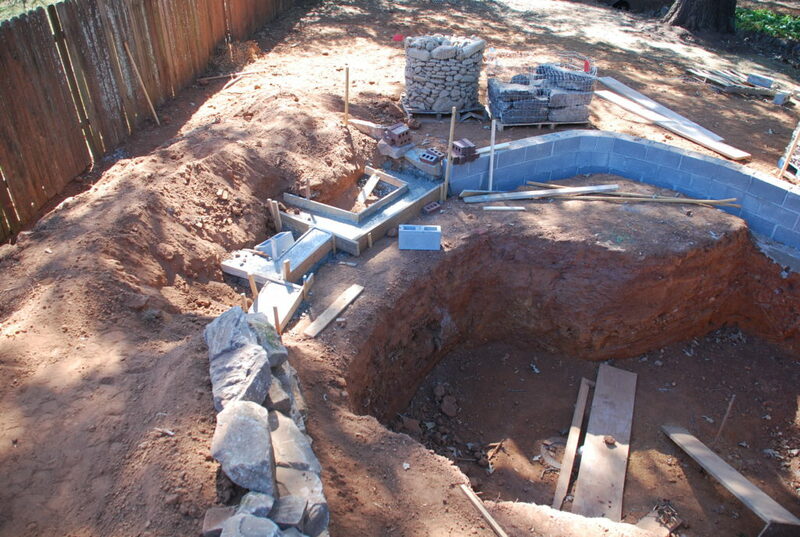 We’re putting in a ‘sunken’ Patio below the pond – down by the ditch. Last week they put in a footing and this week the masons were back to lay some block. Once the block was in place it was time to veneer it with stone. 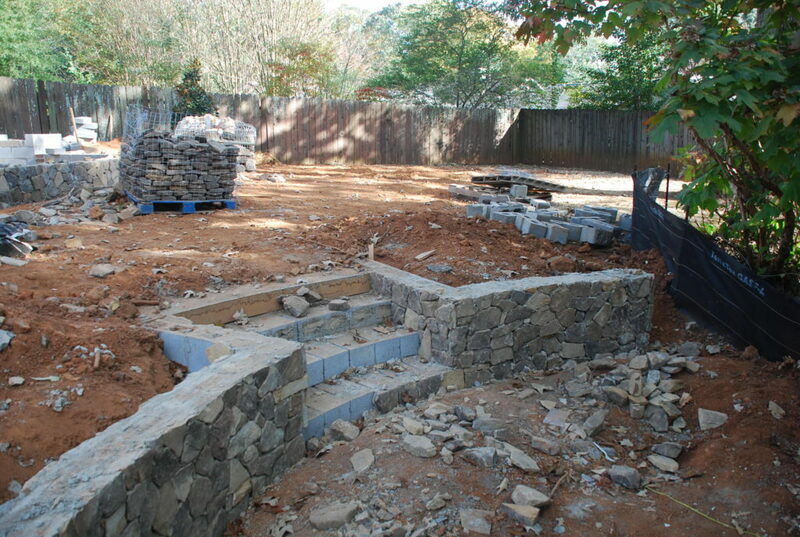 We’ve selected this type/style/pattern of stone for all of the walls in the back and the masons are doing a great job. Here’s a view from above the patio. 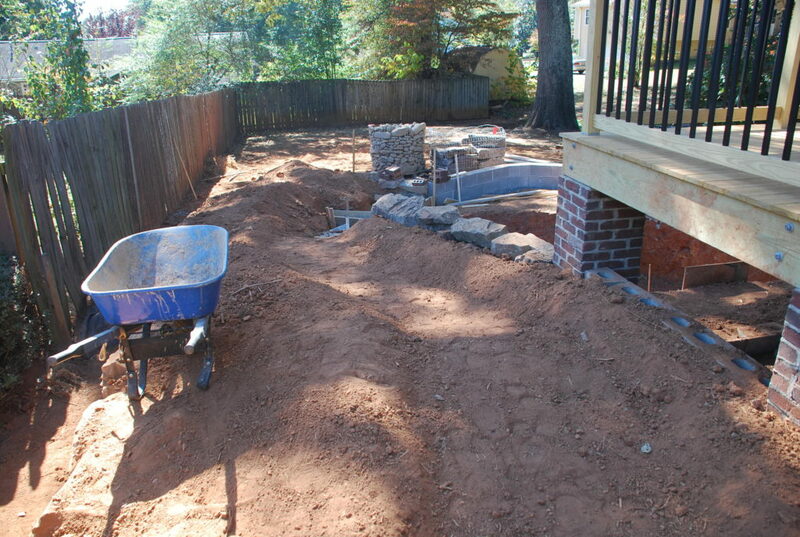 We think it may be a great place for a fire pit – but we’ll wait until the drought is over before we light one! We also continued working on the artificial stream bed that is going to be along the side of the deck and flowing down to a waterfall structure at the head of the pond. 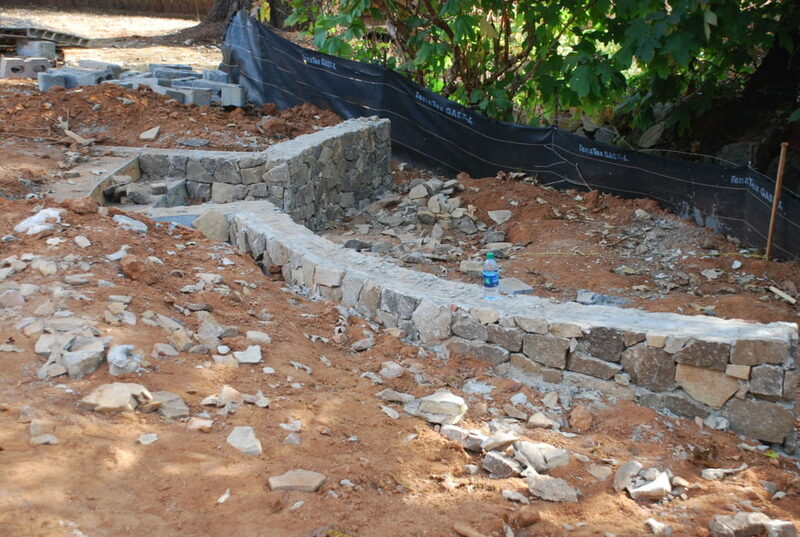 Here you can see the basic shape of the stream starting to take form. 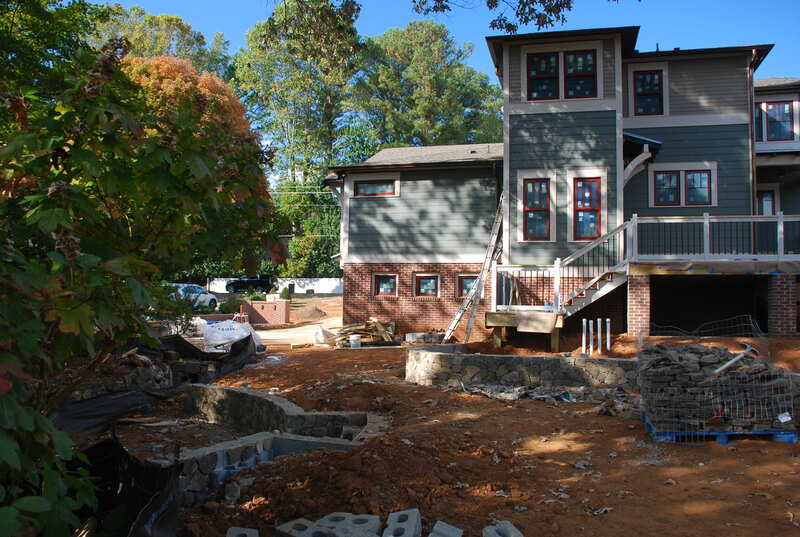 From one of the second floor windows you can see where the waterfall will be. 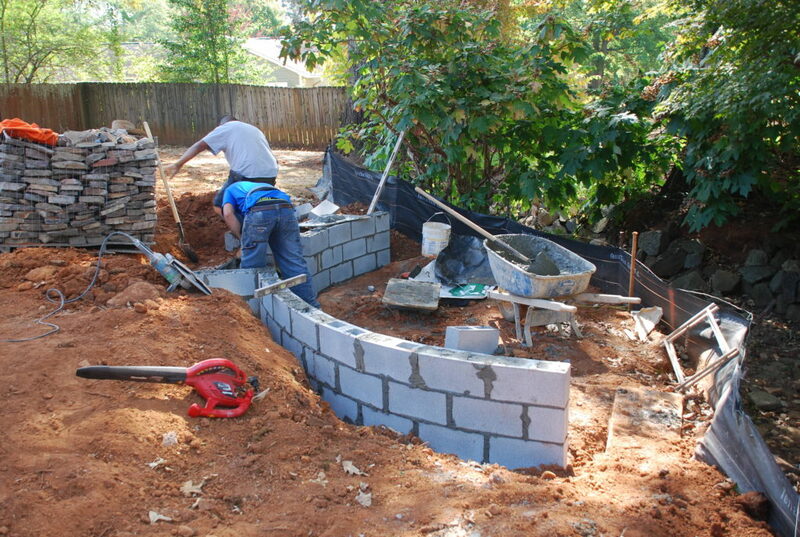 It is critical for the foundation to be structurally sound so that the stone used to build it won’t settle over time – so we put in a concrete footing and then will build up the framework with concrete block. 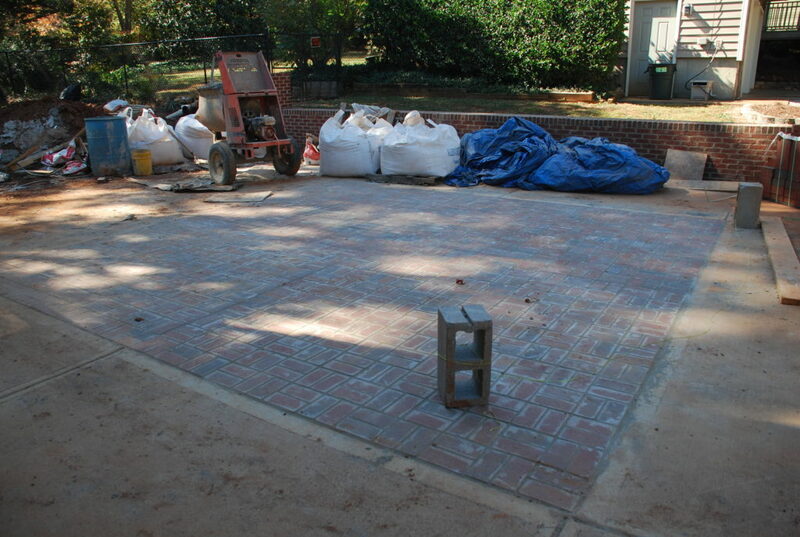 While the masons were there they finished grouting the brick pavers down by the Garage doors. 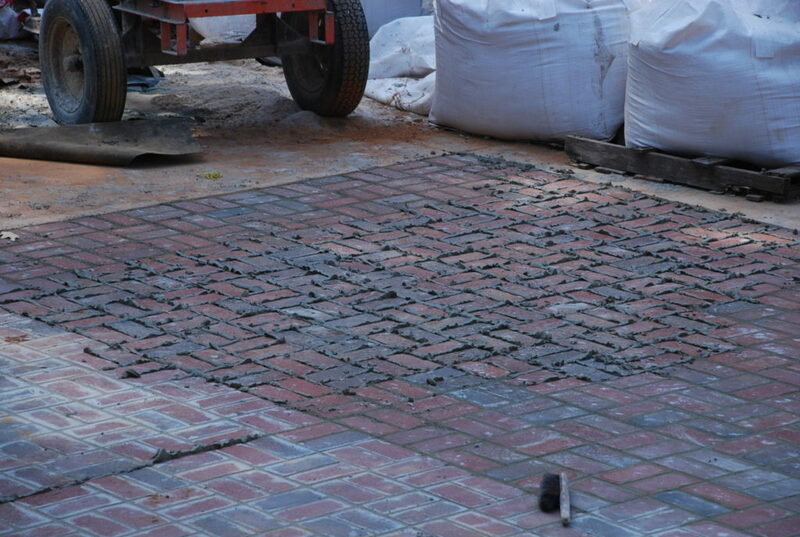 Here you can see the grout ready to be skimmed off and leveled up with the brick. Finally the big hole in the Motor Court is filled and in a few days we’ll be able to drive on it. 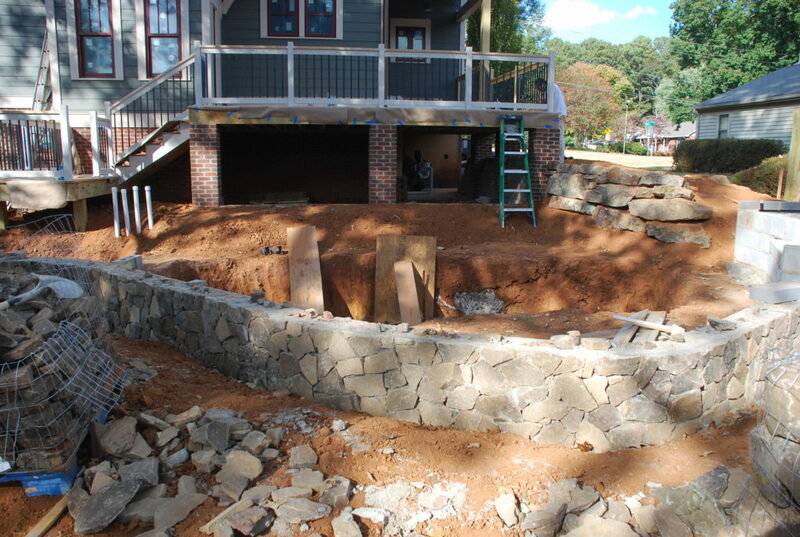 Once the patio wall veneer was finished, they moved to the main pond wall with the same stone pattern. 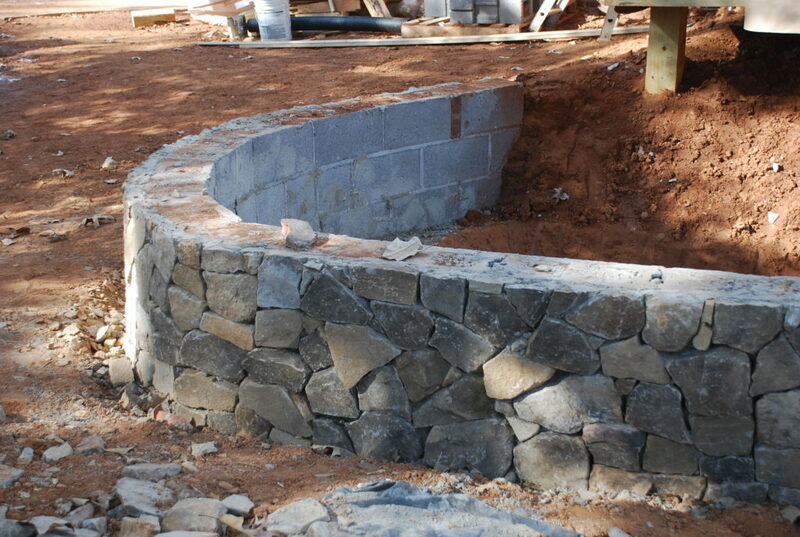 Here’s the end of the wall down by the landing where the water lily pond area is going to be. By the end of the week they finished the veneer on the outside surface of the entire wall. 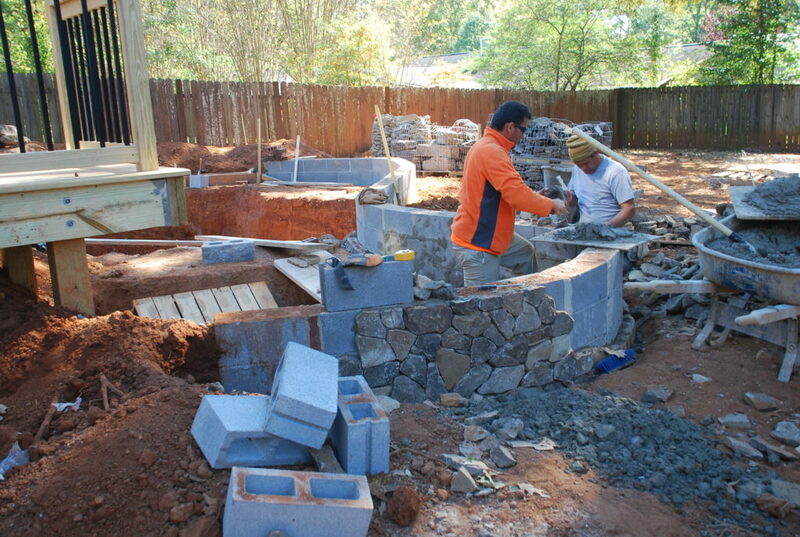 The same stone veneer will eventually go on the inside surface as well, but we have to get the pond liner in place before that happens. 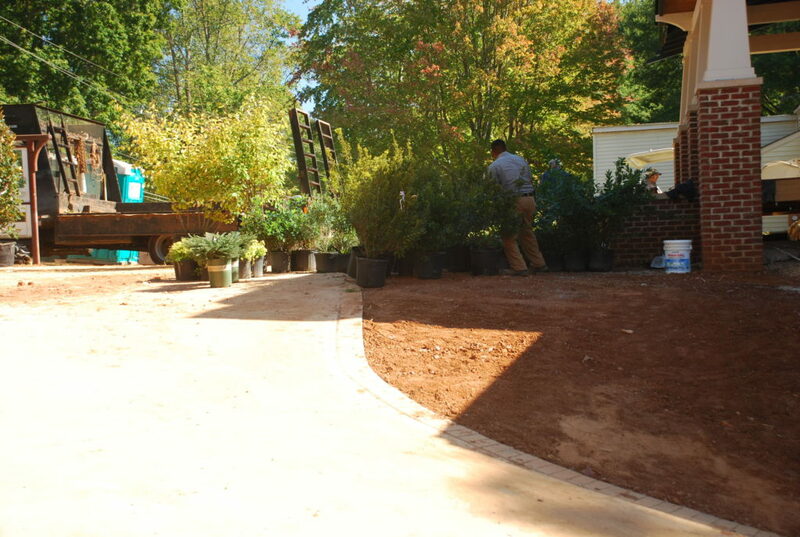 Last week Doug’s guys at Metro North Landscapes got the front yard pretty close to final grade and it is finally time to bring in some plants! We’re a little worried about the drought and trying to keep the plants watered, but we’re just going to have to make a special effort to get to the house and water on a regular basis. It will be much easier once we move back in. 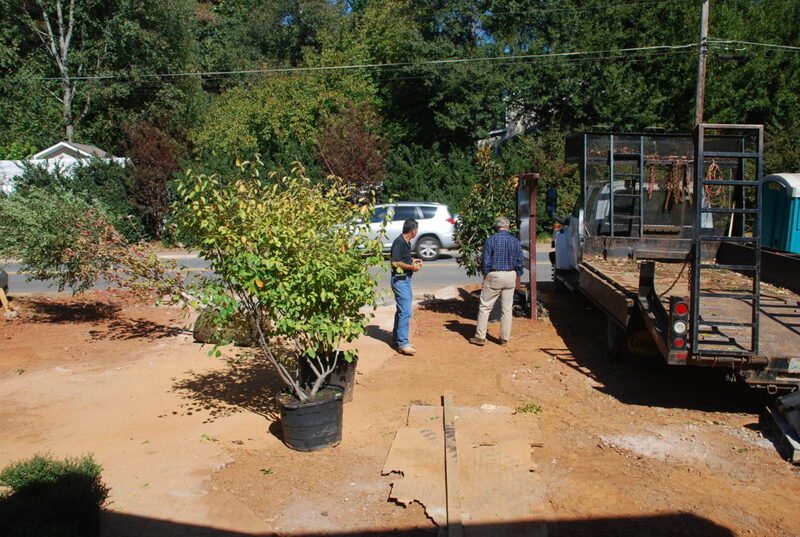 That’s a Serviceberry Tree in the foreground – one of two that will flank the driveway as you pull in. They will have beautiful white flowers in the spring, berries in the summer and nice color in the fall. 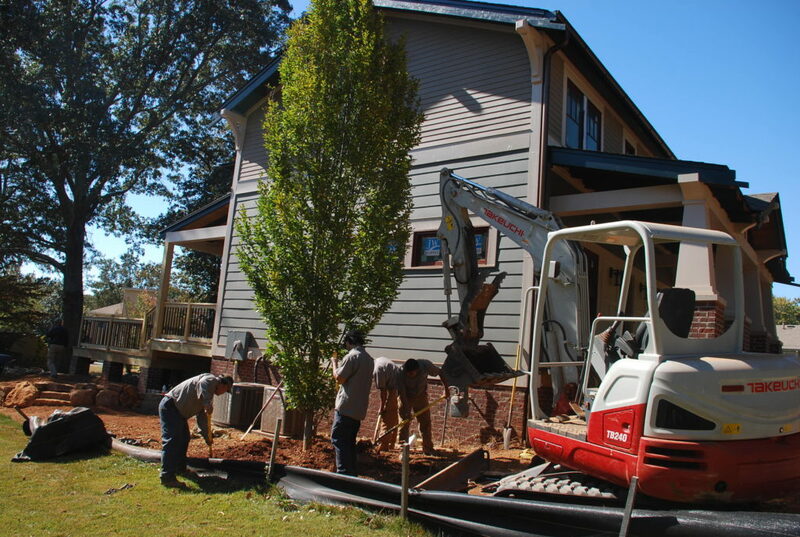 Here is a large Hornbeam tree that we selected to help buffer the left side of the house. We don’t have a lot of width, so we need something that grows tall but not so wide. It took the excavator and 4 guys to manhandle it into place. 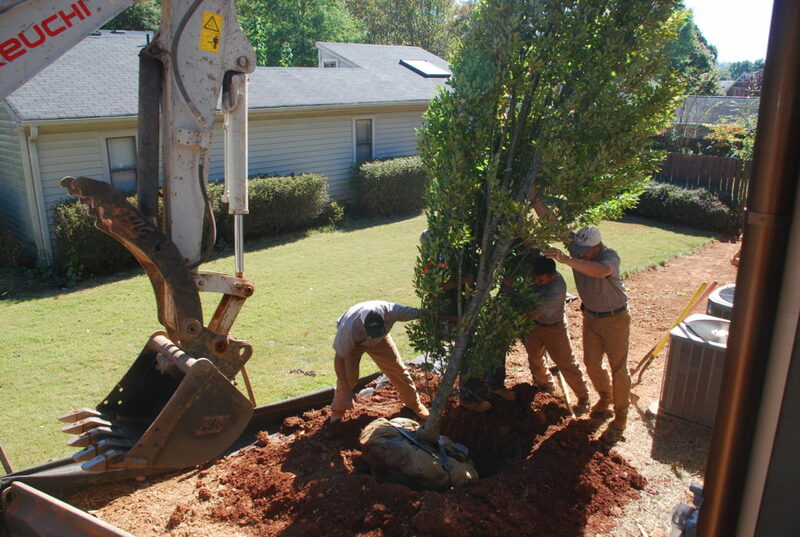 Here is the Hornbeam all set as the guys were backfilling the hole. It should make a nice backdrop through the 3 stained-glass windows that we are going to put in the Dining Room. We made a lot of progress outside this week. Several subs are scheduled to be back next week so there should be some more to show inside as well as continuing the work in the yard. Stay tuned as we start to wrap up this long journey.